We loved our outing to Buxton Fringe Festival – performing an enchanting programme from around the world. With songs from a range of traditions, from sacred to secular, madrigals and folk songs – we got a lovely review from the Festival Reviewer. Thankyou! 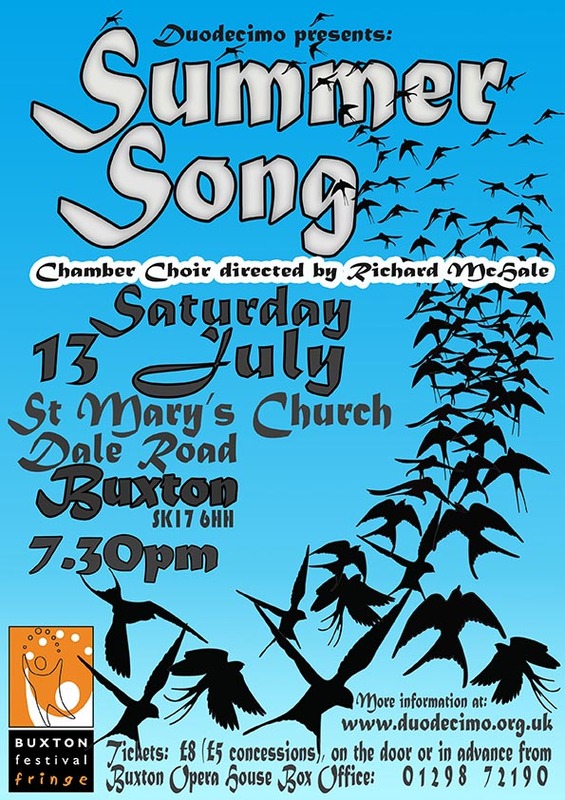 I’ve walked past St Mary’s thousands of times over the last 20-odd years and have never been inside so I have to thank Manchester-based choir Duodecimo for this calming experience after a long day on Buxton Carnival. Duodecimo is 16 strong (9 female voices and 7 male) and has a well-balanced sound that is quietly managed by musical director Richard McHale. The programme presented to us was apparently typical of the choir’s repertoire; the first half was a mixture of sacred and secular ‘early music’ while in the second half the focus was on music composed or collected in the twentieth century. About 20 pieces were played or sung altogether and with such a wide-ranging programme there were bound to be some selections that caught the ear more than others. St Mary’s has a high roof and the acoustic seemed to me better to suit the slower, more layered pieces. So, for example, from the early, sacred pieces Palestrina’s “Sicut Cervus” was particularly good. [During the interval I did ask Richard McHale about his chosen tempo for Monteverdi’s “Cantate Domino” and he explained that the melody was originally a dance and at a slightly faster tempo it would be familiar and recognisable to less-educated worshippers]. From the early madrigals – including pieces by Tomkins, Morley and Desprez – it was the less-familiar Luca Marenzio’s “Scaldava il sol” that stood out. After the interval we moved on about 400 years and began with Stanford’s “The blue bird” and Elgar’s “As torrents in summer” – both sung with sensitivity and grace by the full choir. A brief selection of folk-song pieces was prefaced by a duo rendition of Peter Bellamy’s setting of Kipling’s “Oak and Ash and Thorn” – an unanticipated pleasure. “Bushes and Briars” (collected in Essex by Ralph Vaughan Williams) also sounded fine. The choir concluded with a brief excursion into American popular song – “Let’s Do It”, “Tea for Two” and “I Got Rhythm”. Other solos heard in the course of the evening included two twentieth century French pieces: Gaubert’s “Madrigal” for flute and Poulenc’s Improvisation “Hommage a Edith Piaf”. For both pieces Richard McHale had to cope with a church piano that has a slightly harsher sound than he would have liked. Even so we had music-making that was sensitive and thoughtful. Duodecimo gave us an enjoyable and full evening and I hope to hear them again in Buxton.